1.Grosslage Freyburger Schweigenberg. This covers most of the vineyards along the river of Unstrut. 2.Grosslage Grossjenaer Blütengrund. This covers the area along the Saale north of where the rivers Saale and Unstrut meets. 3.Grosslage Naumburger Göttersitz. This covers the area along the Saale south of where the rivers Saale and Unstrut meets and to where the river Saale meets the river of Ilm (at the town of Grossheringen). 4.Bereich Thüringen. This covers the area south of Grossheringen. Total vineyards around 40 hektars. 5.Mansfelder Seen. This covers the vineyards around the Mansfelder seen. Total around 90 hektars. 6.Weisse Elster. This covers the vineyards along the Weisse Elster. A total of around 20 hektars. 7.Bereich Brandenburg. This covers the vineyards around Werder. A total of around 6 hektars. This shows a fine underripe leafy nose with hints of citrus and a fine minerality. It is medium bodied with a fine structure. Medium concentration. Fine citrusy fruit, mineral style. Good acidity and length. Mineral finish. This is a fine young silvaner which is good for the price. 12,5% alc/vol, 4,1 g/L residual sugar, 6,9 g/L acidity. Price: 8,50 €. The riesling is also grown in the old part of Karsdorfer Hohe Gräte. The nose is more aromatic. Flowery and a light spice and mineral. Tighter and younger in the mouth. Fine fruit, aromatic and flowery. Light minerality. Better structure, but the fruit does not have the mineral intensity or interest as the silvaner. 12,5% alc/vol, 10,5 residual sugar, 7,7 g/L acidity. Price: 9,-€. The weissburgunder is the third grape you find in the old part of the Karsdorfer Hohe Gräte. This wine has a more greenish, balsamic and flowery nose. Some mineral. Fuller wine in the mouth. More concentration. Sweeter and rounder fruit. Elegant style. Mineral and flowery weissburgunder with a lot of interest. Very good and would be interesting to age for a few years. 13,74% alc/vol, 11,7 g/L residual sugar, 5,2 g/L acidity. Price: 9,50 €. The grosses gewächs weissburgunder has a lot more minerality on the nose and some fine hints of white fruits and underripe balsamic notes. It is fuller with more concentration. It is young and a fine mineral effort in the mouth. Perhaps a tad on the rustic side. Good length and structure. This has great potensial. Very fine wine. Price: 17,-€. This shows a sweet flowery nose with hints of earth and some minerality. Fullbodied weissburgunder in the mouth with some sweetness. The fruit is more flowery and some fine minerality. But less interesting than the grosses gewächs. The alcohol is a bit high here. Fine wine, but not the most interesting weissburgunder. 13,74% alc/vol, 39 g/L residual sugar. Price: 14,50 €. Traminer is grown in the new part of Karsdorfer Hohe Gräte. This has a fine and lightly perfumed nose with hints of sweet flowers, spice and minerals. It is fullbodied and a mineral traminer in the mouth. Fine concentration. Fine aromatic fruit blended with an interesting minerality. Fair acidity and decent balance. This is an interesting wine and one of my favorites. It also drinks very well right now. 13,4% alc/vol, 11,7 g/L residual sugar, 5,2 g/L acidity. Price: 14,50 €. The spätburgunder is grown in the new part of Karsdorfer Hohe Gräte. Transparent red colour. Lightly fruity and earthy spätburgunder in the nose with a light touch of oak. Light and more fruity in the mouth. It has a nice florality, but it is a simple and young style of pinot noir without much depth. Fine acidity and little tannins. Not highly interesting. Transparent red colour. A little more aromatic and flowery high-notes nose here. Fruitier and more straight-forward. Lighter in the mouth, but with a fine and intense fruit. Flowery. Fine acidity and balance. Not much tannins here. Good, simple and enjoyable. 12,6% alc/vol, 1,5 g/L residual sugar, 5 g/L aicidity. Price: 9,-€. So we end the tasting with the riesling auslese from 2005. Yellow colour. Lightly honeyed and mineral nose with a fine touch of firn and flowers. Fullbodied riesling in the mouth. Good concentration. Off-dry style. Fine fruit, a little younger and tighter than on the nose. Good structure and length. Very fine, but needs more time. 13,15% alc/vol, 10 g/L residual sugar, 7,9 g/L acidity. Price: 14,50 €. To us Weingut Lützkendorf is perhaps Saale-Unstrut's best overall producer of unoaked wines. His best wines are his weissburgunders, silvaners and traminers from the Karsdorfer Hohe Gräte. Blauer zweigelt has a certain history in the Saale-Unstrut. Being imported in the early 70's it is a grape you find quite widespread and to me it represents the most interesting reds of the region. Deep red colour. More intensity on the nose here. Hints of earth, meat and red berries. Fine body and concentration. Young zweigelt and perhaps a little lighter than those from Autria. But with a fine structure. Good acidity and more tannins than in the other reds. Fine wine. 12,6% alc/vol, 2,5 g/L residual sugar, 5,5 g/L acidity. Price: 14,-€. Sweeter more exotic nose. Tropical fruits, flowers. Fullbodied in the mouth. Again quite sweet. Fatter and more concentrated style. Tropical fruit and some coconut in the finish. Fine balance with a good acidity. Good length. Different and exotic weissburgunder. Good, if you like this style. 13,5% alc/vol, 7,6 g/L residual sugar, 6,7 g/L acid. Price: 14,-€. Nose shows more typical banana-like notes. Also flowers. A little fatter and coarser wine in the mouth. Showing a little minerality, which is nice. Slight fat, but fine balance. Medium acidity. A little noticable alcohol. Decent. 13,0% alc/vol, 8,9 g/L residual sugar, 6,6 g/L acid. Price: 9,95 €. Oak and ripe fruit-notes with lots of high notes. Some port-like notes. Fullbodied zweigelt in the mouth. Much fruit and oak not fully integrated. A little more structure. Fine acidity. Again little tannins. Sweet finish. Needs more time. Seems to have the fruit, but unsure if this gains much from the oaking. Does not seem so complex. 14,0% alc/vol, 0,9 g/L residual sugar, 5,0 g/L acid. Price: 17,80 €. To us Bernhard Pawis made perhaps the finest wines with oak in the Saale-Unstrut. Especially the weissburgunder in barrique was beautifully made. The other wines were a little hit and miss. Lützkendorf's zweigelt from Edelacker was perhaps the finest red wine we tasted in Saale-Unstrut. Those two vineyards are definietly the most well know in the grosslage Freyburger Schweigenberg. But other fine einzellagen include Freyburger Mühlberg from where we tasted a fine riesling from Bernhard Pawis, Burgscheidunger Veitsgrube and Dorndorfer Rappenthal from where Klaus Böhme makes fine wines. The other einzellagen within this grosslage is Steigraer Hahnenberge, Vitzenburger Schlossberg, Freyburger Herrenberg, Gröster Steinberg and Weischützer Nüssenberg. The last einzellage here has a certain reputation, but we have not tasted any wines from here. This grosslage covers the area north of wherer the rivers Saale and Unstrut meet. Within this grosslage there are only three allowed einzellagen; Gosecker Dechantenberg, Naumburger Sonneneck and Burgwerbener Herzogberg. Because of this there is quite a lot of wines from this area marketed with the Grosslage-name. None of the three einzellagen are, as of today, among the best in Saale-Unstrut. The 3,5 hektar large Gosecker Dechantenberg is solely owned by Kloster Pforta and the one wine we have tasted from here showed us a lot of potensial, but the wine was poorly made. Gosecker Dechantenberg silvaner auslese feinherb 2000, Kloster Pforta Lightly golden/brownish colour. The nose is flowery with a lot of minerality showing. No doubt good depth here. But also hints of apricot and some volatile acids. Unfortunately not very cleanly made. In the mouth this is a fullbodied silvaner in an off-dry style. There is a good concentration and again there is some very fine minerality here. But the fruit is rather coarse and rustic with again a noticable touch of VA and hints of earth. The acidity is a bit low in the balance. Some citrus in the finish. Naumburger Sonneneck also has some reputation and Bernhard Pawis bottles a riesling from here which we have not tasted. The last einzellage Burgwerbener Herzogberg lies north of Weissenfels, som distance north of the other einzellagen. The area here includes most of the vineyards around Naumburg and those in Bad Kösen. Naumburger Steinmeister is to us the finest einzellage in this grosslage. This is a quite large einzellage of 37 hektars that is found west of Naumburg, but also included is the vineyards at winzerhof Gussek inside the town of Naumburg. The soil here is muschelkalk with loam, also parts with löss and parts with buntsandstein. There are several growers here that makes fine wines but there is no doubt Winzerhof Gussek is the finest. Underripe and leafy nose. Fine. Some hints of honey and mineral. Good body. Concentrated silvaner. Thick fruit. Some residual sugar. A little old-fashioned style, but very fine and complex silvaner. Fine acidity. Very good. Drinking fine now. 11,5% alc/vol, 9 g/L residual sugar. Lightly underripe flowery nose with light mineral hints. Quite light riesling in the mouth. Dry. More fruity than the nose, but also more mineral showing. Fine acidity and finish. A little light riesling in a fine style. 12,6% alc/vol, 7,0 g/L residual sugar, 6,3 g/L acid. Price: 7,80 €. Riper, more honeyed and aromatic, nose. Fine and complex minerality. In the mouth it has a little more pronounced sweetness and residual sugar. Still almost dry style. Highly mineral effort in the mouth. Very fine and interesting. Fine structure with good acidity. Drinks fine today, but will be interesting to follow. Very good riesling. From 60 years old vines. 12,8% alc/vol, 15,8 g/L residual sugar, 8,2 g/L acid. Price: 14,50 €. Honeyed nose, some sweet flowers and botrytis. Thick auslese in the mouth with more botrytis noticable. Sweet flowery fruit, some minerality showing. Fine acidity. Alcohol showing a little in the finish. Fine, but perhaps even better with lower alcohol. 12,8% alc/vol, 76 g/L residual sugar, 7,7 g/L acid. Price: 13,-€. Quite ripe wiessburgunder in the nose. A bit more neutral. Still also shows some minerality. A little light weissburgunder in the mouth. Fine concentration. More mineral here and nice fruit. Fine acidity and length. Nice weissburgunder. 13,0% alc/vol, 7,4 g/L residual sugar, 6,1 g/L acid. Price: 9,20 €. Ripe and sweet nose. Oak. Honey in the fruit. Also some fine minerality. Fullbodied and fatter style in the mouth with pronounced oakiness right now. But the fruit has the stuffing and the balance is fine. Fruit is quite ripe and sweet, but there is a fine minerality here. Very nice wine indeed. Very fine nose on this. Honeyed, lots of botrytis, but also a refreshing fruity nose. Fat, rich and very thick style in the mouth. Lovely fruit, clean and pure. Lightly tropical notes and lots of botrytis. Acidic finish. Refreshing and fine balance. This is a great TBA with a long future. 201 Oechsle. 10,5% alc/vol, 215 g/L residual sugar, 9,3 g/L acid. Price: 75,- € (37,5 cl) and worth it. Light straw colour. The wine shows a lightly spicy nose with fresh and underripe leafy and flowery notes and a touch of minerality. In the mouth this is off-dry and medium bodied. The fruit is more flowery with fine hints of minerals and a light spice. Not too much depth. More nice and easy-going style. The acidity is quite crisp for this grape giving the finish a light citrusy note. Medium length. Good everyday-wine. Pfortenser Köppelberg is another good einzellage although not perhaps in the absolute top. 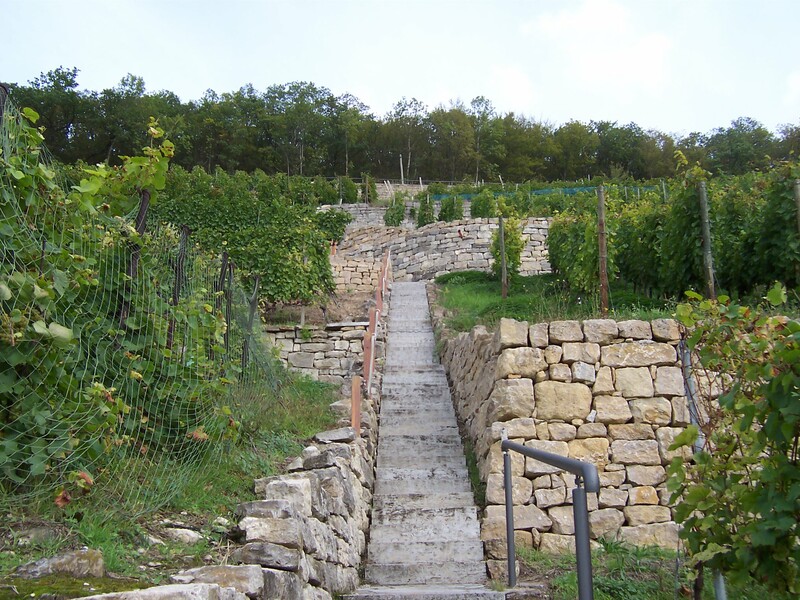 It is the oldest known vineyard in Saale-Unstrut being grown since 1154. The soil in the 12,7 hektar vineyard has mostly weatherings of muschelkalk with some loam ans löss and also gravel. A little more than half of this vineyard is owned by Kloster Pforta. Among other producers is Lützkendorf. The gutedel has a citrusy nose. Hints of flowers and white fruits. In the mouth it has a more refreshing and citric character. This is more the refreshing and elegant summer-wine. Fine citrusy and flowery fruit and good length. Again not too deep. 12,1% alc/vol, 5,4 g/L residual sugar, 7 g/L acidity. Price: 8,50 €. Lützkendorf also makes a fine silvaner from this vineyard that is a little earthier than those from the Karsdorfer Hohe gräte. The other vineyards within the grosslage Naumburger Göttersitz are Saalhäuser in Bad Kösen (potensially also a very good einzellage with rich muschelkalk-soil, but today fully owned by Kloster Pforta who does not make wines that fully releases this potensial), Bad Kösener Schöne Aussicht, Naumburger Paradies and some distance westwards you find the last einzellage here; Klosterhäseler Hasseltal. This area which makes up the southern part of Saale-Unstrut has no grosslage, but you find one of Saale-Unstrut's finest einzellagen here. Kaatschener Dachsberg is an einzellage surrounding the very small village (population less than 100) of Kaatschen. East of the village are newly restored terrassed vines, finished in 2002. 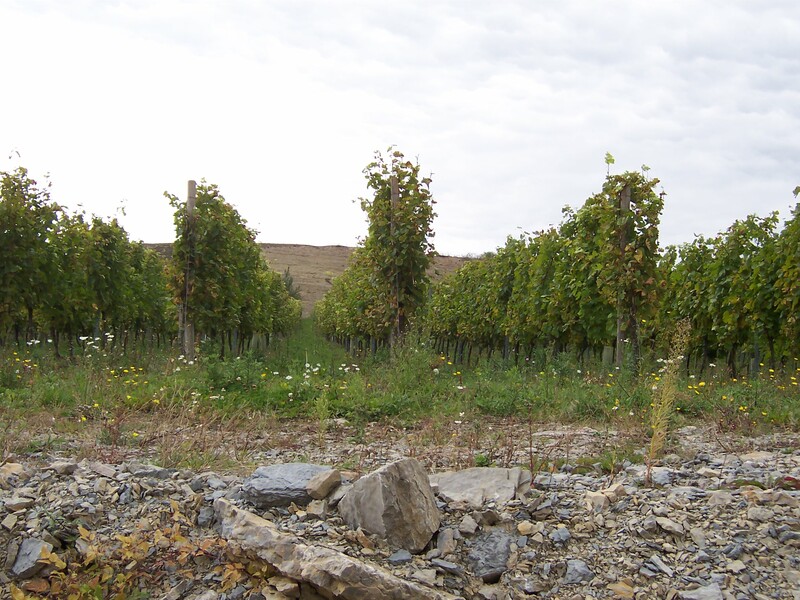 Many of the vines had to be cut down and replanted, but a plot of 80 years old silvaner was saved. All vines here belong to Winzerhof Gussek who makes steely, slim and structured wines from here. Wines that are not very giving as young, but will need time to blossom. Stoney, steely nose. Mineral. Young and tight silvaner in the mouth. Slim, mineral, cool style. Medium concentration. Fine wine that needs a year or two in the cellar. 12,7% alc/vol, 4,7 g/L residual sugar, 6,4 g/L acid. Price 7,90 €. Mineral, stoney nose with more chalk and underripe leafy silvaner-notes. Very fine indeed. More concentration in the mouth. A little sweetness in the fruit. Riper. Young and interesting. Mineral. Good acidity and length. Very promising. Great silvaner. From 80 years old vines. 13,0% alc/vol, 6,8 g/L residual sugar, 5,8 g/L acid. Price 12,50 €. Also lightly underripe nose, but much more stoney and steely with lots of citrus. Light and dry riesling in the mouth. Structured. Citrusy and mineral fruit. Some spritz and brighter acidity. Refreshing and fine light riesling with good length. 11,1% alc/vol, 7,1 g/L residual sugar, 7,9 g/L acid. Price: 7,80 €. Also another stoney and steely riesling, but with some honey on the nose. More powerful in the mouth with better concentration. Sweeter fruit, but still highly steely and stoney. Fine structure and citrusy finish. Seems quite dry. Fine balance. Very fine for the price. 12,3% alc/vol, 10,2 g/L residual sugar, 7,8 g/L acid. Price: 9,40 €. Spicy, aromatic nose. Some perfume and lightly tropical aromas. In the mouth this wine shows a lightly fat in front. The fruit is a little closed. Strangely muted after the open nose. Not too high concentration?? Decent acidity and the alcohol shows a little on the finish. Must retry later to see if the fruit has opened. 13,8% alc/vol, 17 g/L residual sugar, 5,6 g/L acid. Price: 9,90 €. Ripe weissburgunder in the nose, but also fine hints of cold stone and citrus. Slimmer in the mouth than normal for weissburgunder with more pronounced stoney and steely character. Acidity seems a little lower in the balance and the wine a little shorter. Some citrus in the finish. Needs time. 12,7% alc/vol, 8,3 g/L residual sugar, 5,6 g/L acid. Price: 9,20 €. Sweeter nose, more apricot and oak. Hints of flowers and light stones. Fullbodied weissburgunder in the mouth with some oak up front. Young fruit, lots of apricot. Not as concentrated. The steely minerality seems more lost in the mouth. Medium acids. Fair. Barrel-sample. This has a fine nose that is a little yeasty right now with some sur lie-character. Underneath there is fine hints of mineral and anise. In the mouth this shows the fat from the oak better. But this has a very fine balance indeed. Fine fruit and some minerality. More sweetness in the fruit and also more residual sugar. This seems to have great potensial and can really be something magnificent. Flowery and quite aromatic nose. Lightly steely hints. Powerful and sweetish wine in the mouth. Lots of fruit. Concentrated. Flowery, balsamic with a nice underlying steely minerality. Quite refreshing kerner. Fine. 12,1% alc/vol, 64,2 g/L residual sugar, 7,0 g/L acid. Price: 9,90 €. Remember that many of these wines comes from young vines. At the bottom of the Dachsberg to the west of Kaatschen you find Weingut Zahn which is another of the better makers of wines from this vineyard. Although not at all close to Gussek in quality. Light straw colour. The nose is citrusy with hints of flower, balsam and steel. Light and acidic weissburgunder in the mouth. Slim and not the most concentrated spätlese. Highly citrusy fruit. Hints of cold steel. But lacking any depth. Good acidity for this grape and medium length with some citrus in the finish. Decent, but uninteresting wine. The Bad sulzaer Sonnenberg at nearby Bad Sulza also has a certain reputation from the grower Thüringer Weingut Bad Sulza who also makes wines from the einzellage Auerstedter Tamsel. We have never tasted any of them. Other einzellagen in this bereich are; Dornburger Schlossberg, Neuengönnaer Wurmberg, Dorndorfer Ermtal, Grossvargulaer Hopfenberg and far south in the town of Jena there is made wine in Jenaer Käuzchenberg. This is a fine grauburgunder made in a sweet but structured style. Straw colour. The nose shows grape-typical notes of banana and flowers. Also fine hints of spice and a light oakiness and hints of botrytis. In the mouth this shows a more young flowery fruit. It is a sweet and fullbodied auslese with decent concentration of fruit. The wine has been given a gentle oaking which gives it a slight fatness in the fruit. The acidity here is high for this grape and gives the wine a slimness in the structure. Good length. As far as we know there are four commercial producers today in the Weisse Elster; Kloster Posa, who makes wine from the einzellage Kloster Posaer Klosterberg in Zeitz, Weingut Salsitz, who makes wines from the Salsitzer Englischer garten, Weingut Marcel Schulze, who makes wines from the Kloster Posaer Klosterberg and Weingut Stephan Seeliger who makes wines from Wetterzeuber Bischofsleite. We have not tasted wine from any of these producers, but Weingut Salsitz has a certain reputation. This Bereich covers one einzellage; Werderaner Wachtelberg and as far as we know there is only one producer here Weinbau Dr. M.Lindicke. Vines have been planted here since 1985. We have not tasted these wines. So as a little summing up; to us the best vineyards in Saale-Unstrut are; Karsdorfer Hohe Gräte, Kaatschener Dachsberg, Freyburger Edelacker and Naumburger Steinmeister. There are also other vineyards that with more care and attention has the potensial of being equally good as these four. In a way these four vineyards also sums up the regions three clearly best producers: Winzerhof Gussek, Weingut U.Lützkendorf and Weingut Bernhard Pawis. While we were in Saale-Unstrut we met a person with a lot of insight on the wine-scene in the region. We asked him about his sight of the region's wines. After a little thought he said that there were perhaps not that many great wines from Saale-Unstrut, but there were also very few poorly made wines. In a way we feel he is right. Of all the wines we tasted in Saale-Unstrut there was very few that was downright poor. We find more poor wine when in Mosel for example. Perhaps it is due to the fact that this region is so young when it comes to wine-making. The knowledge of making wine is a new thought and up to date. But there might be a lack of fully understanding the land you are working with. Most producers started to make wine during the 90's. So that is not many years of experience. This might also have led to another thing that struck us with this region; the lack of unity, the lack of a common focus of what a Saale-Unstrut wine should be. Most producers make wine from up to 10 different varieties and there are at least 20 different varieties that are common in this region. That is too much to make a sense. Also producer seem to focus more on variety-name than on vineyard-name - one thing that sets it appart from most other german wine-regions. We think this is not a wise move. It would be better to focus on fewer grapes and focus more on vineyard-names. Because there are some great wines made in this region and there are some very fine einzellagen. From what we tasted in the region the most interesting wines were from silvaner, weissburgunder, traminer and riesling for whites and blauer zweigelt for reds. The silvaner and the weissburgunders are more neutral-tasting varieties that makes the land speak more than the grape. It suits many of the einzellagen in Saale-Unstrut. There is also a lot of weissburgunders made in barrique. We are not the most barrique-friendly persons in the world, but have to admit a lot of those barriqued weissburgunders are very good. None of the barriqued weissburgunders we tasted in Saale-Unstrut were overoaked. Taste Bernhard Pawis' weissburgunder in barrique as a fine example. They were all finely balanced and they were also the wines that best fit with the local food. So no doubt these wines have a place in this region. Traminer is another, perhaps weird, grape that made some excellent wines in Saale-Unstrut. They are less perfumed than gewurztraminer, still aromatic and full wines with fine balance (taste Lützkendorf's dryish auslese). They were also wines that went well with the local food. Riesling is always good. It is good in this region too. But it is easier to get a little underwhelmed. Perhaps because we are so used to great riesling from Germany. There are great riesling from Saale-Unstrut too, but they will have a hard time trying to match the great rieslings from the more known regions. For the reds there is a lot of spätburgunder and portugieser to be found. Like the spätburgunders from other regions in Germany those from Saale-Unstrut also gets to thin to make any huge impression. Portugieser can be fun, flowery and joyful. But the blauer zweigelts are the ones that offers both something new and something interesting. At last you find a fullbodied, ripe and interesting german red (taste Lützkendorf's zweigelt from Edelacker). Finally a couple of other grapes that should be mentioned is kerner that also can make serious wines in this region and even müller-thurgau makes easygoing wines that there is no shame to drink. 100% spätburgunder. This was a nice sparkler that had a little sweet flowery fruit. More Franciacorta-like than Champagne-like. Straw colour. Medium bubbles. The nose is a bit sweet with hints of flowers, some minerality, citrus sligh oak and a nice depth. The mousse is not the finest, but fair. It is a fullbodied sparkler in the mouth with good concentration. Again a little sweet and flowery fruit. But there is some depth and fine minerality here. Good acidity and quite refreshing style. Good. One very positive thing about the wines from Saale-Unstrut were that wine-makers were less obsessed with residual sugars. Most wines found their own natural balance and wine-makers did not seem to care if the residual sugars was 5 g/L or 15 g/L as long as the balance was there. What an utterly un-german and astonishingly relaxing idea - that wines can find their own natural balance without having to reach any borders. I really hope other regions (not to say officials and other organisations of interests - I did not say VdP did I??) will learn from Saale-Unstrut and follow this idea. To do a wine-trip to Saale-Unstrut is both fascinating and confusing. When you are used to the other wine-regions in Germany you are used to regions where the complete focus is on wine. That is not how things are in Saale-Unstrut. Wine is only a small part of the local business. Not only must you search hard to find traces of wine-producers. In some cases you also must search hard to even find the vineyards. They are few, scattered and often very hard to find. The only exception is the village of Freyburg, which is the only village in Saale-Unstrut that would fit in the description as a wine-village. It is surrounded by vines and the beautiful terrasses of the Edelacker. Within town you can find nice small restaurants and cafeterias and also some places to buy wine. But you quite fast gets used to the idea that in Saale-Unstrut wine is not a large industry, it is there, but only as a small part of everyday-life. The area is a beautiful area. Especially the old part of Naumburg has a lot of beautiful buildings like the old Dom. But even here you are easily and fast struck by the reality. Which is that this part of Germany has it's problems. The differences in income is large and many people live very poorly. Depopulation is a problem. Several buildings are left empty and are not well kept, while the neighbours have beautiful and well-kept houses. But the people are very nice and have lots of stories to tell, and some good wines to sell. The region needs and deserves more attention. Wine is one way of getting it.